The Asian Development Bank (ADB) is pivotal for creating demand and the conditions for widespread privatization in virtually every sector in the Asia Pacific region, from transportation, energy and urban development to agriculture, water and finance. Based on an infrastructure-led ‘growth’, the corporate sector is aggressively pushed in ADB supported projects through public-private partnerships (PPPs), loans, co-financing and another series of financial instruments. Under discourses of inclusive as well as environmentally sustainable growth and regional integration, the ADB backs up projects to accelerate trade and investment, especially in countries well endowed with natural resources, despite the recognized environmental damage and alienation of local populations. Key among these are the infrastructure projects in transportation, energy, and information and communication technology, as well as policies and regulatory and financial systems to attract private capital for investment in infrastructure projects. In its Strategy for 2020, the ADB promotes a larger role for the private sector in financing infrastructure, either as a project sponsor or by promoting investment forms commonly used in financial markets, like bonds and equity funds (to understand these different investment forms, see also WRM Bulletin 181). The ADB also promotes ‘economic corridors’ as pockets of high infrastructure development to attract private investment and facilitate the flow of free trade and investment. 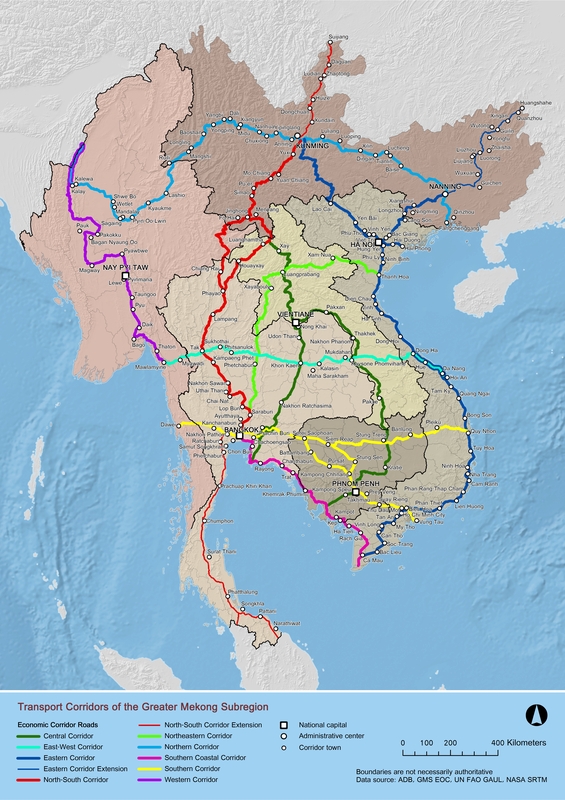 The Greater Mekong Subregion (GMS) is the ADB’s flagship regional integration programme. Initiated in 1992, the GMS aims to transform the Mekong region into a region-wide free trade and investment area, fuelled and led by corporate sector operations. The majority of the capital investment has been in transportation (road, railways, air and waterways), energy, telecommunications, tourism, trade, agriculture and strengthening the corporate sector. Since 1992, infrastructure projects totalling around US$10 billion have either been completed or are being implemented. Among these are the upgrading of the Phnom Penh (Cambodia)-Ho Chi Minh City (Viet Nam) highway and the East-West Economic Corridor that will eventually extend from the Andaman Sea to Da Nang in Vietnam (1). The economic corridor strategy is also being supported in India. In the Indian state of Chhattisgarh, the ADB will provide US$ 430,500,000 to support six transportation corridors and road networks that will pass through forests and indigenous areas, near rich coal and mineral deposits. One of the most destructive projects that the ADB is involved in is the Delhi-Mumbai Industrial Corridor (DMIC), a mega infrastructure project that runs from Delhi to Mumbai through six states, covering an overall length of 1,483 km. The DMIC includes the construction of super-highways, power plants, ports, railway lines, airports, satellite cities, magnet towns, industrial nodes, technology parks, etc. The current estimated investment needed to operationalize the DMIC is US$ 90 billion, the majority of which is coming from the Japanese Government with significant involvement of the ADB. Although the Indian Government is the ‘owner’ of the DMIC, 75% of the projects in the DMIC will be privately owned, through PPPs. Despite ADB appealing language on poverty reduction, the DMIC in India, for example, will seize lands up to 200 km on both sides of the Delhi-Mumbai Dedicated Freight Corridor, while the proposed 11 investment regions and 13 industrial areas will require land of 100 to 250 km2 each. Approximately 180 million people will be affected and hundreds of thousands of hectares of agricultural and grazing lands will be lost to corporate growth industries that will bring few benefits to local populations. The DMIC will capture the water needed by farmers to grow food and by rural communities for their daily lives. Studies show that the rivers in the DMIC region are already under severe stress and cannot withstand greater exploitation (2). Water and land acquisition for the DMIC will displace millions of people, destroy precious natural environments and resources, and trigger violent conflicts between local communities and state security forces. Furthermore, the ADB’s lending program in India for 2013–2015 will be allocated across four core infrastructure sectors: transport, energy, urban, and agriculture and natural resources, and two crosscutting sectors: finance and skills development. The Country Partnership Strategy 2013–2017, currently being formulated, will include the development of high-priority economic corridors, create markets for infrastructure finance, and promote regional ‘integration’ through the South Asia Sub regional Economic Cooperation (SASEC) platform (3). Governments are expected to acquire land, secure access to water and mineral deposits, facilitate financing, risk protection and guarantees, and put in place policies and regulations required to ease the operations of private companies. But participation in decision-making about such projects, are not extended to local communities whose lives and livelihoods are irreparably damaged by them. The Second Chittagong Hill Tracts Rural Development Project in Bangladesh will likely require land acquisition from local communities who constitute over 40% of the country’s indigenous population. The ADB’s development model is predatory, undemocratic, discriminatory and destructive. This model secures benefits for corporations and upper classes, but will impoverish workers, small-scale farmers, fisher-folk, indigenous communities, and rural and urban poor populations. Those who resist or call attention to the injustices of the model are branded as anti-development and anti-state, persecuted and incarcerated. The ADB cannot be reformed, it must be stopped. It is imperative that we join forces to resist the ADB’s extractive, destructive development model and privatization agenda.